• Azman Eye Care Specialists / Global Complex Eye Care – Timonium, Md. • Briggs Vision Group – Dunwoody, Ga.
• Shoreline Optometry – Mountain View, Calif.
• Spring Hill Eyecare – Spring Hill, Tenn.
• Vancouver Vision Clinic – Vancouver, Wash.
• West Shore Eye Care – Ludington, Mich. The honorees will convene for the first time at the 2019 Best Practices Summit in Austin, Texas later this month. An overview of the Best Practices program was recently released on OD Wire TV. Future OD Wire TV episodes will provide an opportunity for this year’s honorees to share about their areas of interest and expertise… and what makes each of their practices a Best Practice. For ongoing updates about this year’s honorees and the group’s activities, bookmark the Best Practices category page on CooperVision’s ECP Viewpoints℠. Applications for the 2020 Best Practices program will open this fall. Congratulations to the 2019 Best Practices honorees! Optometric physicians in states with an advanced scope of practice can choose from several modalities for incising, ablating, or tightening tissue when performing office surgery. Experience, the nature of the procedure, and the type of tissue under consideration, such as the thin skin of the eyelid or the thicker periocular skin, as well as cost, can all impact the choice of instrumentation selected. With the possible exception of ophthalmic lasers, no other piece of modern technology has influenced the evolution and practice of procedural optometry as has office-based radiosurgery. Modern radiosurgery involves a radio-wave generator (Fig 1) that emits a 4-MHz radio wave that travels from a wire fitted handpiece (active electrode) through the patient to a ground plate (passive electrode) placed underneath or nearby the patient. The bioelectrical impedance (resistance) of human tissues to the radio wave transmission causes a combination of selectable tissue desiccation, protein coagulation, and intracellular cytoplasmic liquid-to-gas conversion with resultant rapid volume expansion which causes the cell to explode (volatilize) at the point of contact with the active electrode. In effect, a combination of cutting, coagulation (hemostasis) and tissue desiccation (fulguration) modes are selectable. A decided advantage for optometric surgeons lies in the fact that collateral tissue damage can be minimized or carefully controlled by proper technique and appropriate selection of waveforms. The optometric surgeon creates a radiosurgical incision by using a smooth continuous motion at an ideal speed of ~ 7mm per second. Unlike a scalpel, a radiosurgical electrode wire cuts without any downward pressure. The configuration of the active electrode, its contact time with the tissue, the intensity of power, waveform mode, along with the frequency determine the quality of the incision. The active electrode wire delivers energy into the tissue at the point of contact when the device is activated (Fig. 2). It is used to cut, coagulate tissue, or both. Many electrode configurations, including several uniquely designed for optometric procedures such as lid lesion removal, punctal occlusion, and follicular ablation (for the treatment of trichiasis) are available. The optimal electrode configuration depends on the intended procedure and the optometric surgeon’s experience and preference. Ergonomically designed electrodes favor the optometric surgeon while performing specific procedures. For example, small loop electrodes are particularly useful for removing small papilloma’s, raised nevi, and other benign periocular lesions. RS tissue ablation, shave biopsies, and incisional or excisional biopsies can efficiently be performed. Careful ablation techniques allow for the precise and deliberate volatilization of cutaneous lesions with little to no involvement of normal lid structures. Trichiasis is correctable via RS follicular ablation and a 0.004″ insulated needle electrode inserted along the hair shaft directly into the lash follicle. Direct destruction of the hair follicle with little to no trauma to the hair shaft provides for post-procedure patient comfort and significantly minimizes the incidence of regrowth. The passive electrode (Figure 3) is the antenna plate that receives the radio waves emitted from the active electrode and returns the energy to the device completing the circuit. Unlike an electrocautery unit, the passive electrode is not a grounding terminal and does not have to be in contact with the patient’s skin. Placing the antenna plate close to the active electrode improves overall efficiency, decreases the power required to cut tissue or coagulate small bleeders, and reduces lateral heat spread minimizing the possibility of collateral tissue damage. The contact time between the active electrode and the tissue is directly proportional to both the energy transferred to the tissue at the point of contact and the amount of lateral heat transferred to the collateral tissues. With all parameters appropriately set, the electrode should move smoothly through the tissue at a rate of about 7mm per second. Proper power intensity can be adjusted dynamically throughout the procedure and varies with the hydration status of the tissue being incised or ablated. The optimal power setting allows for adequate heat generation within the target tissue to volatilize cells at the tip of the electrode. With proper power intensity, the electrode passes smoothly through the tissue with little to no sparking, charring or dragging through the tissue. Modern radiosurgical devices generally accommodate four waveform settings or modes, in addition to an adjustable power setting or waveform amplitude. In addition to the four unipolar waveform configurations, many also allow for the attachment of a bipolar coagulation forceps. The bipolar forceps are safer to use on patients with implantable medical devices such as implantable defibrillators and tens units, as the current only travels between the tips of the forceps and is not dissipated throughout the body. The fully filtered, or continuous, waveform setting yields a smooth cutting action and generates the least amount of lateral heat. 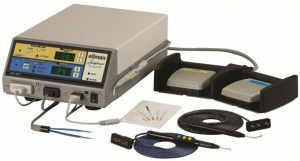 Utilizing the continuous waveform setting and a fine-wire electrode produces incisions that are comparable if not superior to that made by the sharpest scalpel. Clinically, this setting is referred to as the “cut” mode. The fully rectified modulated waveform dissipates some lateral heat that is useful in hemostasis. This mode is referred to as the “blend” mode (cut/coag). Because of its combined efficacy at simultaneous cutting and coagulation when used with a large-diameter needle electrode, this blended waveform is excellent for subcutaneous tissue dissection. The third option is the partially rectified-modulated waveform. This waveform significantly increases lateral heat transmission, resulting in excellent hemostasis. This mode is clinically referred to as the “coag” mode. The fourth waveform is the fulguration setting, also known as the spark-gap waveform. This most destructive setting is never used on the eyelid, for cutting skin, or on any tissue in which scar formation is to be minimized or avoided. Modern radiosurgical devices operate at frequencies of 3.8-MHz to 4-MHz compared to electrocautery and electrosurgical devices which operate at much lower frequencies, in the 300-KHz to the 500-kHz range. The higher RS frequencies result in less lateral distribution of heat from the incision and a more precise application of energy. The ability to control the degree of lateral heat dissipation is a great advantage to the optometric surgeon in that damage to the adjacent periocular tissues is minimized while at the same time procedural hemostasis is enhanced. RS devices can be fine-tuned to generate controlled amounts of lateral heat to seal not only small vascular vessels but also lymphatics, reducing intraoperative and postoperative edema. RS electrode wires of varying thickness and shapes are used in combination with the different waveform options to maximize these beneficial effects. Two final considerations are the need for a high-efficiency smoke evacuator and overall equipment cost. As of this writing, RS devices run anywhere from $6000 – $60,000, depending on the options and global capabilities of the devices purchased. A known disadvantage of radiosurgery is that particulate smoke is generated during the procedure. An OSHA-compliant electrosurgical smoke evacuation system must be utilized. 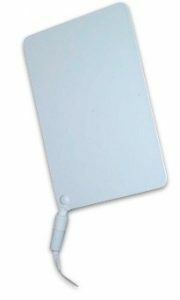 Care must be taken to avoid using alcohol or other flammable substances when preparing skin if RS electrodes will be employed. Today’s optometric physicians have several alternatives for making incisions during office surgery. Consideration as to the methods employed and instruments used will be based on the surgeon’s preferences and experience, the particular tissue to be cut, the procedure to be performed, and the cost of equipment. Radiosurgery offers the optometric surgeon the advantages of efficient incision making along nonlinear contours in highly deformable tissues. The added benefit of enhanced hemostasis provides a practical solution to creating incisions in highly vascular tissues, such as the eyelids and periocular skin, which in turn contributes toward minimizing complications and maximizing functional and cosmetic outcomes. Of all the specialties, ophthalmology practices have been hit the hardest in terms of diagnostic code changes. The grand total comes in at just over 100 updates, so we’ve got a lot of ground to cover! In addition to new neoplasm codes, you’ll have several more options for disorders of the eyelid, lacrimal system, and orbit — including paralytic ectropion, cicatricial lagophthalmos, rosacea conjunctivitis, meibomian gland dysfunction, and others. As with most code changes this year, CMS is aiming at greater specificity.